Computer simulation showing distribution of the orbital debris spawned by the explosion of the U.S. Air Force's DMSP-F13 satellite. The February explosion of an American military satellite may cause some problems for orbiting spacecraft after all, a new study reports. The U.S. Air Force's 20-year-old Defense Meteorological Satellite Program Flight 13 (DMSP-F13) craft blew apart on Feb. 3 after experiencing a power-system faillure. 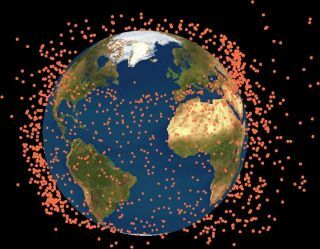 Analyses by the European Space Agency and other organizations found that the cloud of space junk generated by the explosion shouldn't pose much of a threat to their missions, but the new research suggests that not all spacecraft are in the clear. Study leader Francesca Letizia, a graduate student at the University of Southampton in England, and her team spotted 100 new chunks of debris produced by DMSP-F13's violent end. This number suggests that the explosion also created more than 50,000 pieces smaller than 1 millimeter in diameter, the scientists said. "Even though many of these objects will be no bigger than the ball in a ballpoint pen, they can disable a spacecraft in a collision because of their enormous speed," co-author Hugh Lewis, also of the University of Southampton, said in a statement. The team mapped out the spread of DMSP-F13's cloud using new modeling techniques that treated the pieces of debris as a fluid. "Treating the fragment band as a fluid allows us to analyze the motion of a large number of fragments very quickly, and much faster than [using] conventional methods," said co-author Camilla Colombo, who's based at Southampton as well. The researchers then used these maps to assess the collision risk to spacecraft circling Earth. They found that smaller pieces of DMSP-F13 debris could indeed hit some satellites, particularly American and Russian satellites that reside in sun-synchronous or polar orbits. "Our work has shown that the introduction of a new cloud of small-sized debris into orbit will have increased the risks for other spacecraft in the vicinity, even if the risk from the larger fragments has been discounted," Lewis said. The new study was published in the Journal of Guidance, Control and Dynamics.